Some times ago I wrote a barcode scanner NPAPI plugin for the HTML5 browser by zetakey. 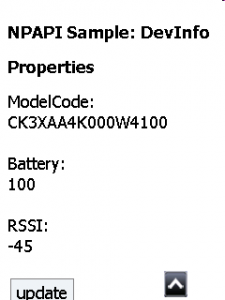 It is based on code supplied as MySensor in the motorola knowledge base. The plugin is for Windows Mobile 6.x based devices by Intermec and another one for M3 devices. The MySensor plugin based on npruntime was the only sample I could get to compile and work correctly. The barcode scanner fork I wrote does also work very well. The new MyDevinfo plugin retrieves model code, battery level and WLAN RSSI value of the Intermec device and allows to present this information to a HTML5 browser user when needed. The above shows the web page of MyDevinfo_simple.htm.